As the start of fall rolls around, all of our favorite things come back. Starbucks’ overpriced fall drinks, freezing cold weather, and the odd sight of Christmas trees in stores far too early. Personally, my favorite part of fall is when all of my favorite TV shows come back. Last night, Saturday Night Live came back in full swing, with plenty of anti-Trump material under their belt. Though the show’s cold open starring Alec Baldwin as Donald Trump may have captured attention, the true showstopper came during the Weekend Update segment. This bit, hosted by Colin Jost and Michael Che, features many of the most important news stories of the week. The segment became so popular that NBC produced a special edition of it titled ‘Weekend Update: Summer Edition’. 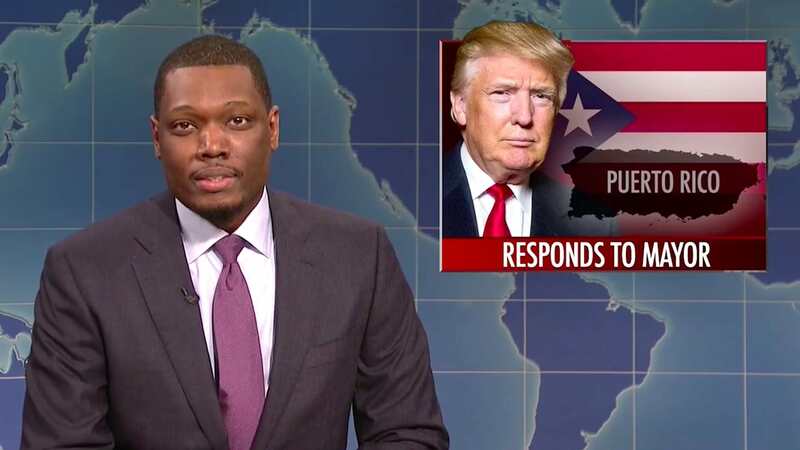 In addition to Che calling Trump out on his lack of humanitarian efforts in the territory, the episode also included a cold open where Trump (Alec Baldwin) told Mayor Cruz of Puerto Rico (Melissa Villaseñor) that she needed ‘FEMA prime’ to get faster relief and Jay-Z wearing a Colin Kaepernick jersey during his performance.